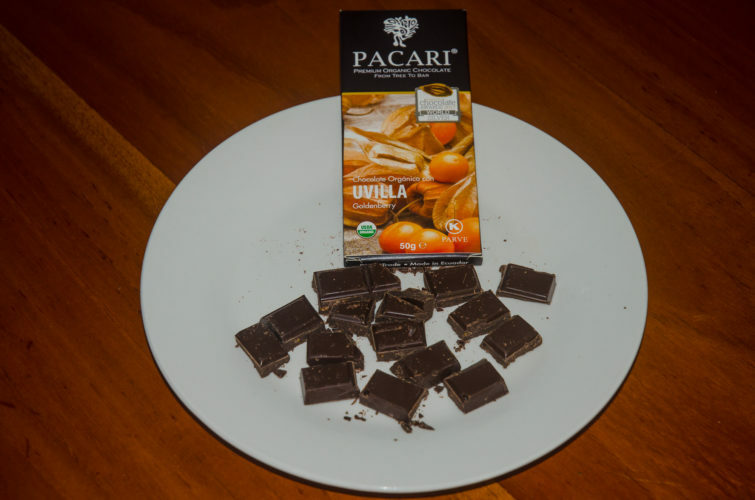 In an epic taste test, the Galakiwi team scoured the Galapagos Islands to gather every single possible Pacari chocolate flavor we could find. 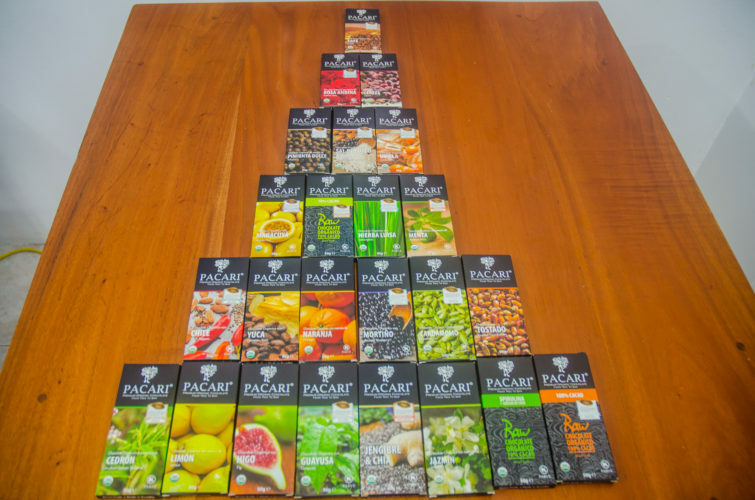 Perhaps the best brand of chocolate from Ecuador, Pacari boasts numerous gold, silver and bronze awards from the International Chocolate Awards. Galakiwi secured 24 flavors for this taste test. 14 different Galakiwi team members participated in the taste test and the only rule we had for an official “rating” was that three team members had to try the flavor. All of the flavors had a 60% cacao content, with a few exceptions. It was clear from the start that some of us had different preferences, but in the end there were some clear winners and losers! 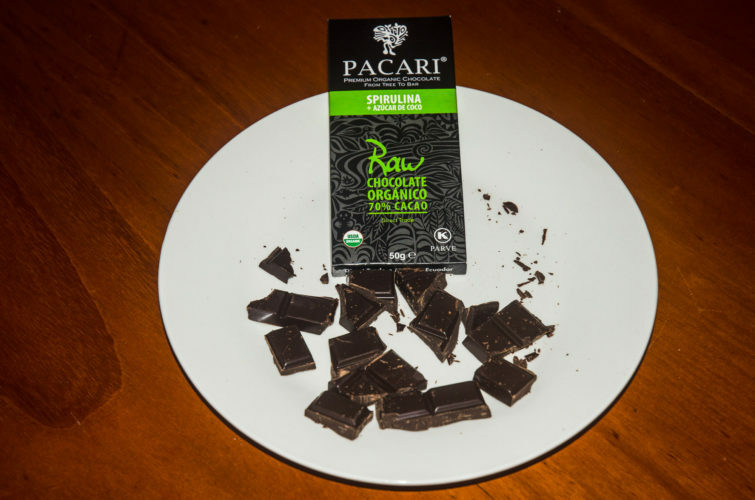 We had five flavors of Pacari chocolate score 8/10 or greater, and four flavors score less than 6/10. A third of the flavors we sampled scored between 6-6.5/10. Four flavors received perfect 10/10 scores from some of our team, this included Cherry / Cereza, Sal de Cuzco & Nibs / Cuzco Pink Salt and Nibs, Café / Coffee and Rosa Andina / Andean Rose. The most diverse ratings happened for the Jengibre & Chia / Ginger & Chia flavor, which received ratings as high as 9/10 and as low as 1/10! It seems some people really love or hate ginger. We found over time that you needed to try at least 3 “squares” from the chocolate bar to get a really good taste. Letting the chocolate melt in your mouth, instead of quickly biting and chewing it was the preferred method too. 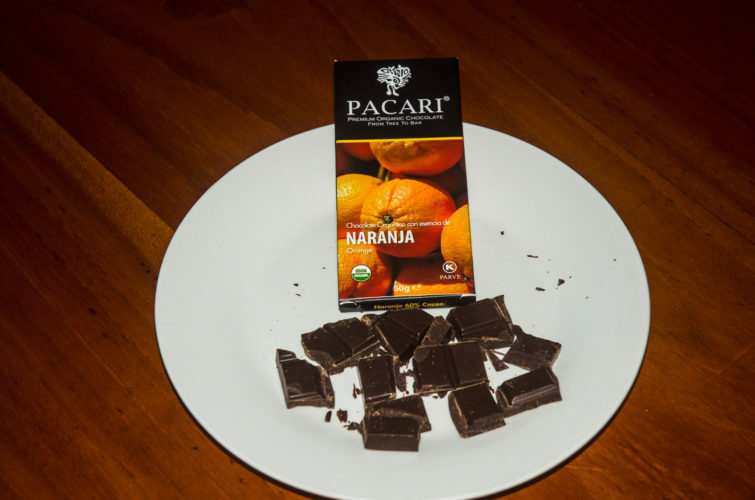 We really liked that the Pacari chocolates are organic, without soy, without gluten, vegan friendly, and sourced responsibly and exclusively produced in Ecuador! Here they are, the ratings you’ve been waiting for, and the results of all of our hard work in the office in the Galapagos! 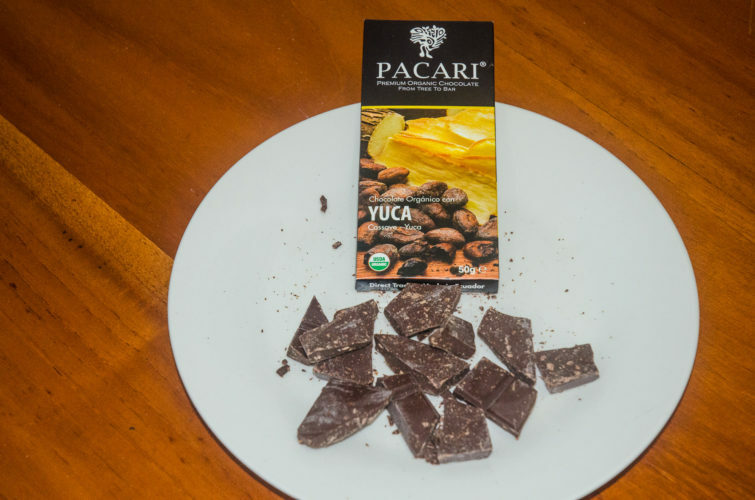 Ingredients: Organic cacao beans. May contain traces of nuts, peanuts and dried fruit. Whoa. Is it good? 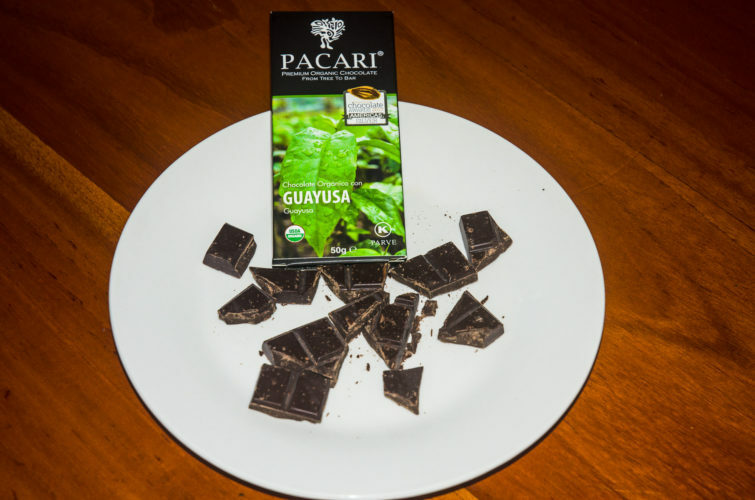 We have no idea, who eats pure cacao?? Tim, Paul and Andrea didn’t even finish their pieces. To quote Crystal “ohh, that is hideous, it is not worth the calories!” Overall: Needs sugar, maybe use it in hot chocolate, which Paul did to finish off his portion. Cristhian appreciated it the most with a 6/10 rating, while nobody else rated it higher than 2/10. Pepo was a good dad and didn’t let his kids try this flavor, out of fear their love of chocolate may be tarnished. Not knowing what spirulina is caused some people to be uncertain with their votes. 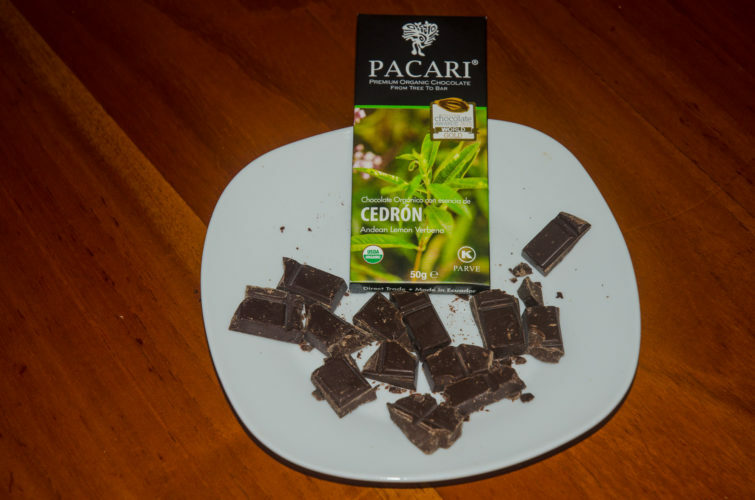 Maybe 70% cacao was too strong for some people too, as this was the actually the first higher % bar we sampled. Turns out spirulina is a bacteria in the form of a blue-green algae that may have some health benefits to it. Strange. Ingredients: Organic cacao paste, organic cane sugar, organic cacao butter, organic sunflower lecithin, organic jasmine essence. Floral aromatics! Tasty, different, nice. 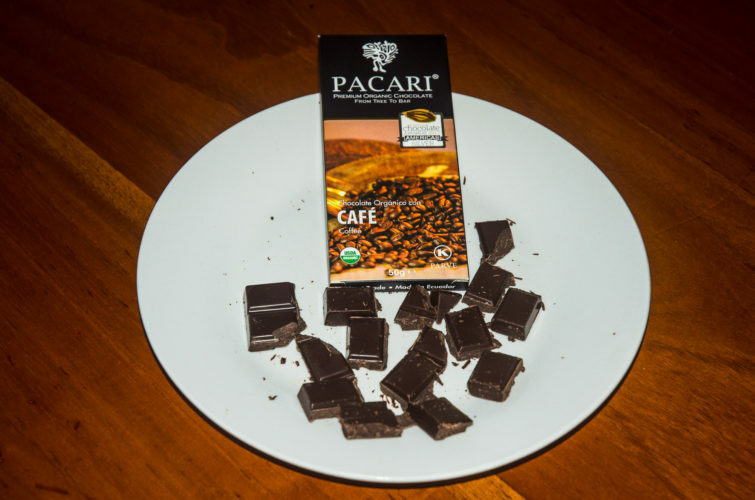 These were the common responses to tasting this flavored 60% cacao chocolate from Pacari. Andrea and Cassandra both thought it tasted just like dark chocolate, with no jasmine flavor. Ingredients: Organic cacao mass, organic cane sugar, organic cacao butter, organic chia, organic dehydrated ginger. May contain traces of nuts, peanuts and dried fruit. Leidy can’t handle the ginger spice, giving it a 1/10 rating! Zambo liked the chocolate but not the ginger kick at the end. Crystal said “it’s not the worst thing in the world, but Im not a fan of ginger.” A divisive flavor for sure. Gingers lovers rejoice, the rest suffer. Ingredients: Organic cacao mass, organic cane sugar, organic cacao butter, sunflower lecithin, organic guayusa. May contain traces of nuts, peanuts and dried fruit. With some Galakiwi members possibly suffering from chocolate overdose on day 9 of the chocolate tasting, the rest of the team carried on! Guayusa? Interesting. Enjoyed by most it had a unique aroma, like something was fermenting. Cristhian: “it isn’t just chocolate, you can taste the added flavour more than some.” Dave despised it, everyone else enjoyed it. 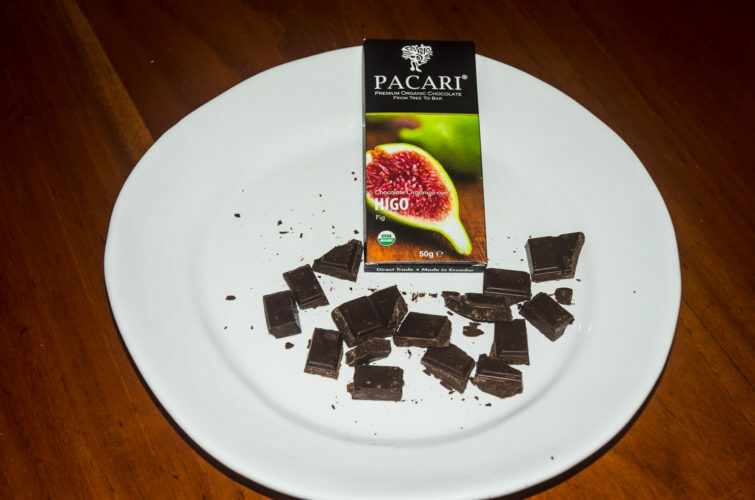 Ingredients: Organic cacao mass, organic cane sugar, organic cacao butter, organic dehydrated fig, sunflower lecithin. May contain traces of nuts, peanuts and dried fruit. Dave: “where’s the fig? Just straight up chocolate taste to me.” Andrea: “tastes like chocolate with seeds.” Jenny liked this one the most giving it an 8/10 but everyone else thought it was average, at best. 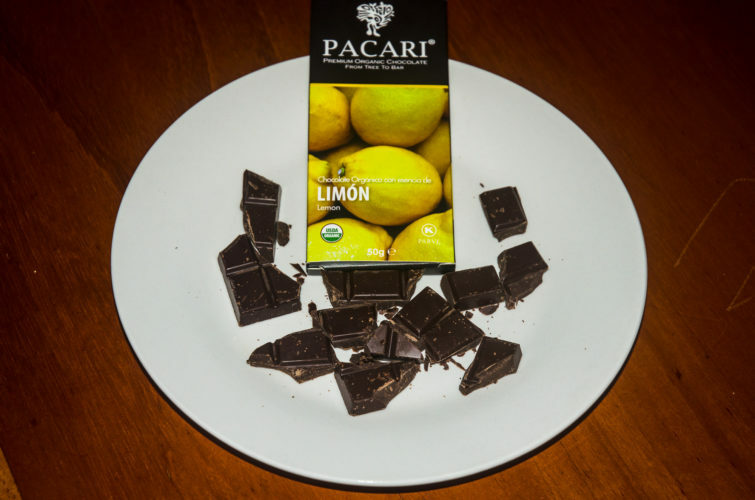 Ingredients: Organic cacao paste, organic cane sugar, organic cacao butter, organic sunflower lecithin, organic lemon essence. Lemons comes through if you let it melt in your mouth, as opposed to chewing it. Good fragrance and taste, without overpowering lemon flavor. Overall thought was: Good, could be better. Ingredients: Organic cacao mass, organic cane sugar, organic cacao butter, sunflower lecithin, organic lemon verbena essence. May contain traces of nuts, peanuts and dried fruit. Floral, a bit minty kind of like the menta or cardamom flavors we also tried. 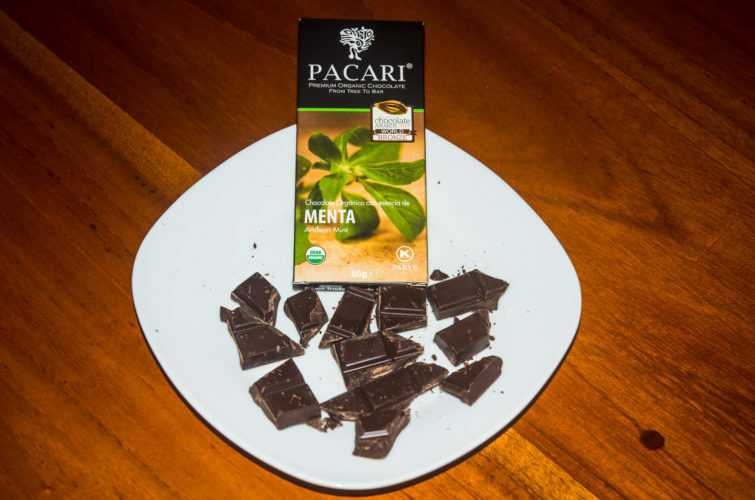 Good chocolate vs lemon verbana balance. Mixed reviews overall, with Crystal bringing down the average rating by giving it a 4/10 rating. 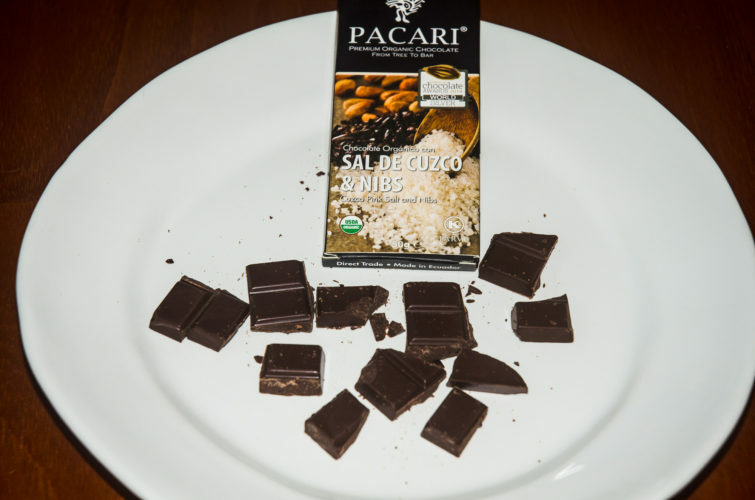 Ingredients: Cacao mass, cane sugar, cacao butter, roasted corn kernels. May contain traces of nuts, peanuts and dried fruit. The only one not labelled organic! Likely because of the toasted corn? Needs more tostado chunks to be better. Not as chunky as the yuca version. Dave: “I like tostado as a snack, but this is a bit plain.” Tostada is toasted corn kernels, which are a common snack in Ecuador and the Galapagos Islands. Interestingly ratings for this version were quite high from our members who were born in Ecuador, while our volunteers and team members from other countries rated it lower. Leidy rated it highest at 9/10, Tim rated it lowest at 5/10. Ingredients: Organic cacao paste, organic cane sugar, organic cacao butter, organic sunflower lecithin, organic cardamom essence. Earthy, pleasing. Fresh and zippy. 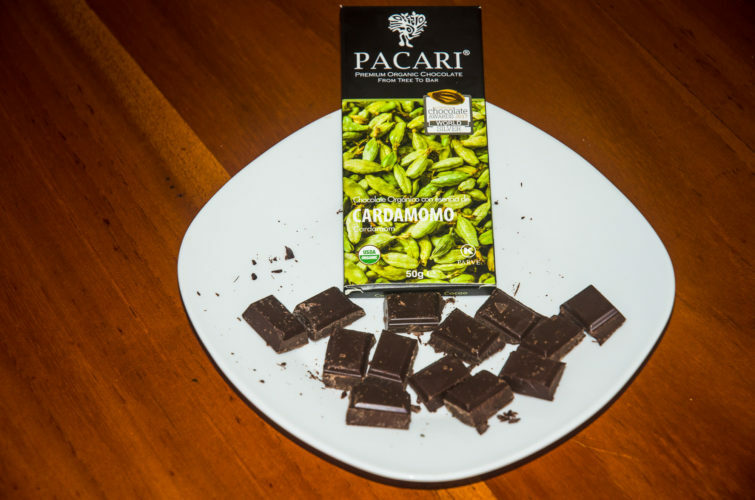 Most people had no idea what a cardamom or cardamomo was. But for the most part, they liked it. A unique flavor for chocolate, but it worked quite well, with many Galakiwi members rating it 8/10. Ingredients: Organic cacao mass, organic cane sugar, organic cacao butter, organic wild andean blueberries (dehydrated), sunflower lecithin. May contain traces of nuts, peanuts and dried fruit. This flavor had high expectations as someone declared it their favorite ahead of time. But it did not quite live up to expectations. Slight hint of a bit of a sweet blueberry taste. Not very strong, could stand out a bit more upfront but has a slow, growing, aftertaste that is quite appealing. Andrea liked it most, while Paul brought the rating down with a 5/10. Ingredients: Organic cacao paste, organic cane sugar, organic cacao butter, organic sunflower lecithin, organic orange essence. Dave: “vibrant orange flavour. Some people hate chocolate oranges, I like them.” Chocolate shines through, orange lingers. 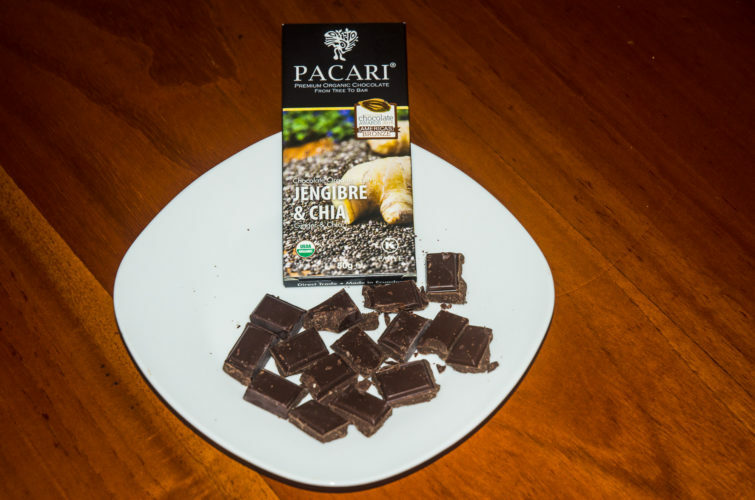 Ingredients: Organic cacao mass, organic sugar, organic dehydrated cassave, organic cacao butter. May contain traces of nuts, peanuts and dried fruit. Has little crunchy bit surprises built in, simple but good. Overall a more enjoyable “crunchy” chocolate bar than the tostado version, although it doesn’t really add any extra flavor, just crunch. Ingredients: Chocolate (organic cacao mass, organic cane sugar, organic cacao butter, sunflower lecithin), organic merken. May contain traces of nuts, peanuts and dried fruit. Cristhian enjoyed it, but got surprised by the heat. After a bit of coughing all he could say was “Fuerte.” Pretty strong kick, nice heat gets you at the end. Doesn’t distract from the chocolate up front though. Great balance. 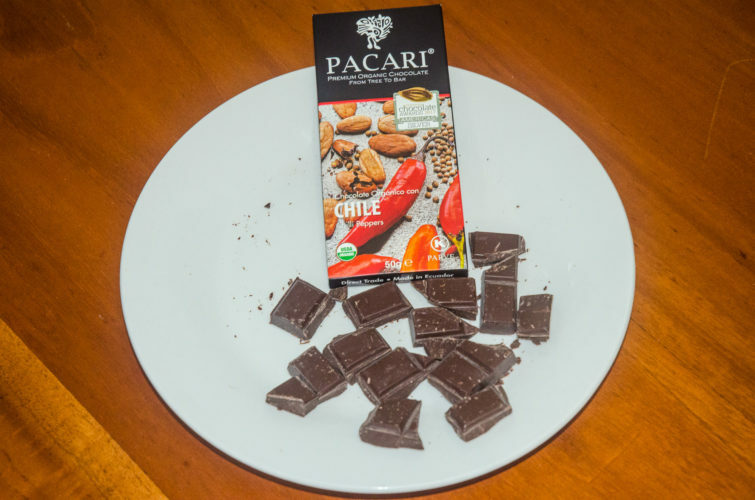 Dan and Paul were not as sure if spicy chocolate can be better, so some mixed reviews on this one, but overall high ratings. Ingredients: Organic cacao mass, organic cane sugar, organic cacao butter, sunflower lecithin, organic mint essence. May contain traces of nuts, peanuts and dried fruit. 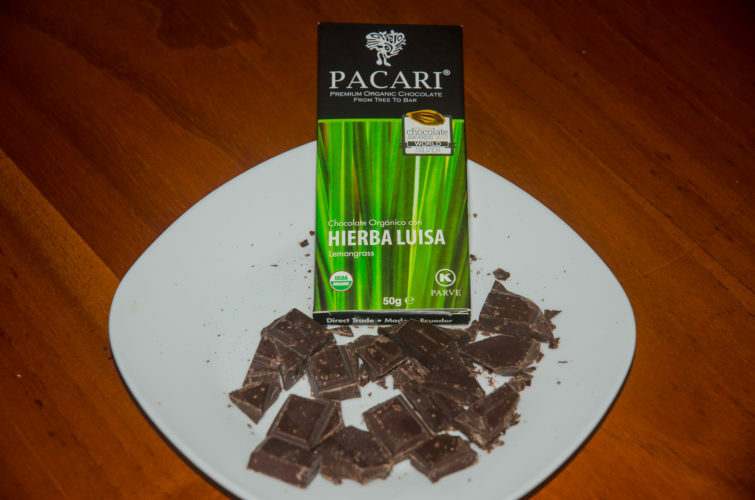 Now we are getting into the higher rated Pacari chocolates. Cass: “first taste was delicious, then it went down from there. Don’t like the end.” Andrea: “tastes like mojito!”. Big mint aroma, hits you upfront on flavour too, then a dense, rich chocolate flavor. Dave: “it’s fresh and bright tasting.” You could call this a refreshing chocolate flavor. Ingredients: Organic cane sugar, organic cacao mass, organic cacao butter, sunflower lecithin, organic lemongrass essence. May contain traces of nuts, peanuts and dried fruit. A bit medicinal on flavor. Crystal declares that she doesn’t like herbal chocolates, only fruit chocolates and drags down the score by being the only one to rate it lower than 7/10. 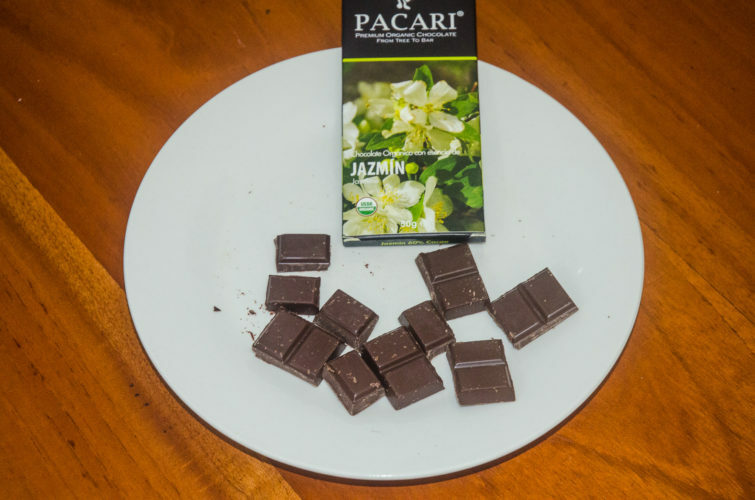 Ingredients: Organic cacao beans, organic cane sugar, organic cacao butter, sunflower lecithin. May contain traces of nuts, peanuts and dried fruit. After the 100% cacao from before, people were fearful of this, at first only taking a small piece to sample. But then they came back for more, as the creamy 70% cacao worked well. Very good and very rich. 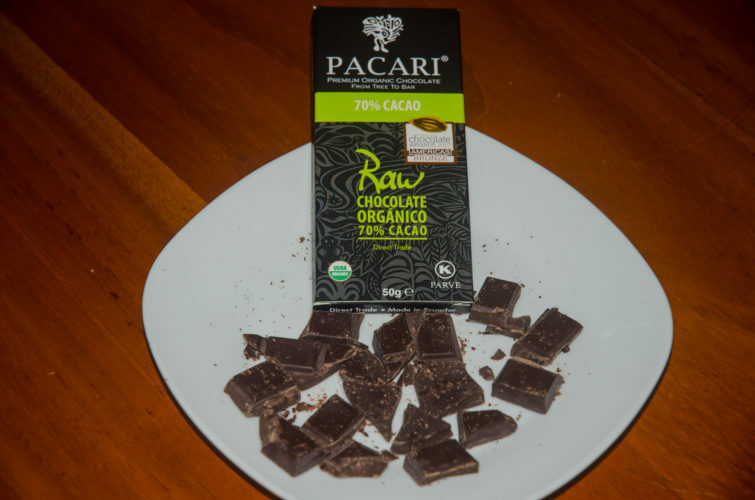 Dave: “borderline extreme…I think 70% may be the sweet spot for me, but until we find the 85% version I wont know for sure.” Everyone agreed this 70% pure cacao version was much better than the 70% version with spirulina in it. 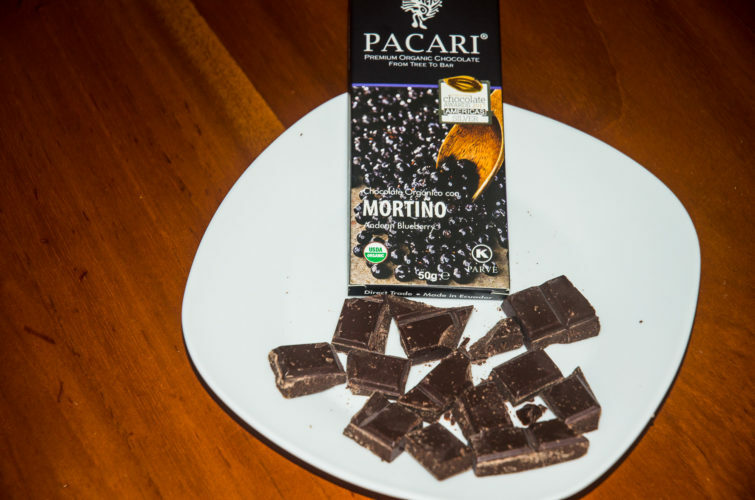 Ingredients: Organic cacao mass, organic cane sugar, oganic cacao butter, passion fruit, sunflower lecithin. May contain traces of nuts, peanuts and dried fruit. The first flavor where all of our Galakiwi samplers rated it at least 7/10. 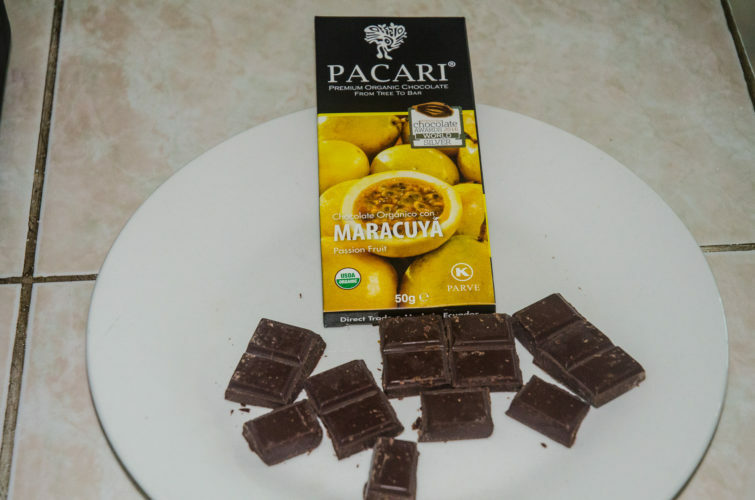 Chocolate up front, maracuya at the end. Balances very well, a nice combination of flavor. Nobody could find anything bad about this one. Ingredients: Organic cacao mass, organic cane sugar, organic cacao butter, dehydrated organic goldenberry, sunflower lecithin. May contain traces of nuts, peanuts and dried fruit. Chewy pieces within, best enjoyed slowly, instead of chewing quickly. Different than any of the other options. Otherwise not much berry flavor. 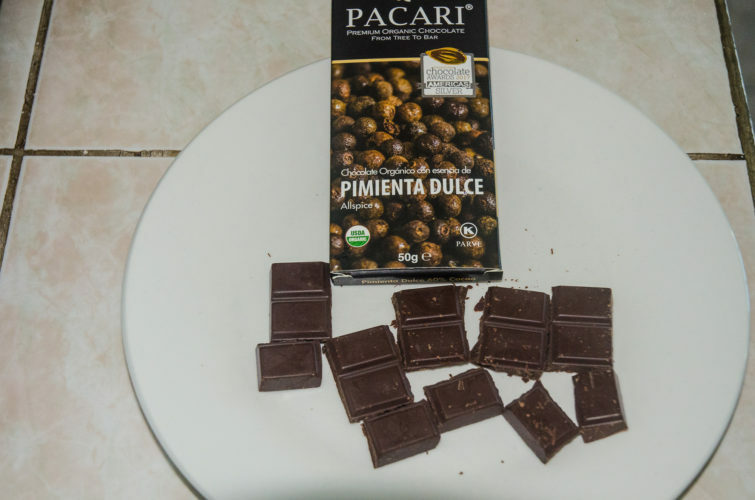 It is the consistency of the chocolate that got the high ratings, more than the added flavor from the goldenberry. Ingredients: Chocolate (organic cacao mass, organic cane sugar, organic cacao butter, sunflower lecithin), organic cacao nibs, salt. May contain traces of nuts, peanuts and dried fruit. Subtle saltiness. Adds a nice element. Andrea: “I never had salt in chocolate before.” This one got a big bueno from Jenny! Not quite as amazing as most thought it would be, with the exception of Jenny and her 10 rating. Ingredients: Organic cacao paste, organic cane sugar, organic cacao butter, organic sunflower lecithin, organic allspice essence. Andrea: “tastes like Christmas”. This one has a festive flavor. Probably the most surprising entry in the taste test competition, as nobody really thought of allspice being a good flavor in chocolate. As strange as it may seem, it really worked. Only one person rated this lower than 8/10. Ingredients: Organic cacao mass, organic cane sugar, organic cacao butter, organic dehydrated cherry, sunflower lecithin. May contain traces of nuts, peanuts and dried fruit. 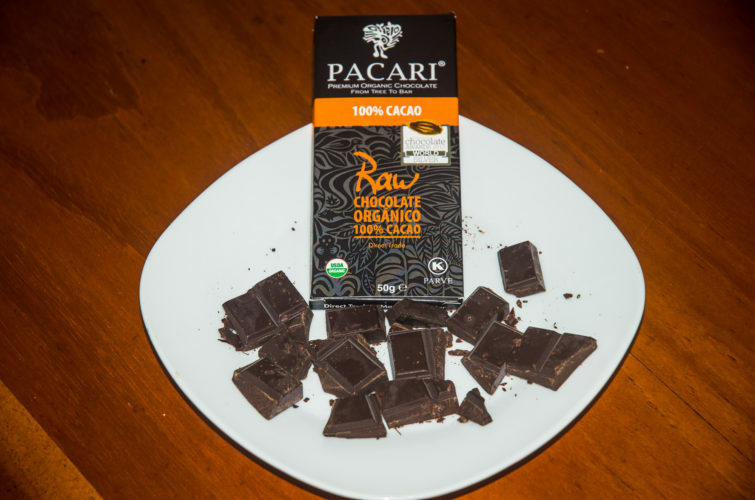 Ranked #3 on our list, and the highest rated Pacari chocolate that hasn’t won an international award. Paolo and Leidy both gave this a 10 rating. Despite the high overall rating, taste-wise it was quite mild, without much fruit taste or aroma. Perhaps a ore intense cherry flavour would detract from the fine chocolate base? Ingredients: Organic cacao mass, organic cane sugar, organic cacao butter, sunflower lecithin, organic rose essence. May contain traces of nuts, peanuts and dried fruit. Strong aroma, that lingers a long time, with an obvious, but pleasant floral aspect. Surprising and delicious. 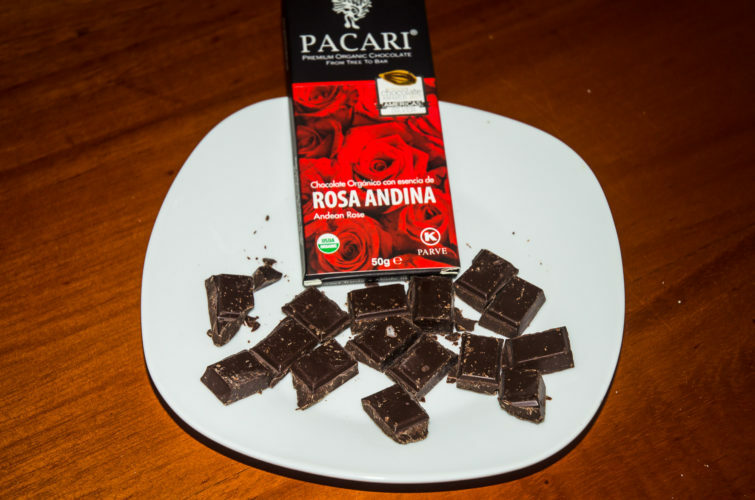 Who knew combining a rose and chocolate would turn out to be such a perfect pairing? You need to try this one if you can find it! Ingredients: Organic cacao mass, organic cane sugar, organic cacao butter, organic coffee, sunflower lecithin. May contain traces of nuts, peanuts, and dried fruit. Even with more tasters on this one than many other flavors, it came out on top! Wow, people like coffee, and people like chocolate with coffee! Multiple 10/10 ratings, a 9.5/10 from Paolo and nobody rating this one low. 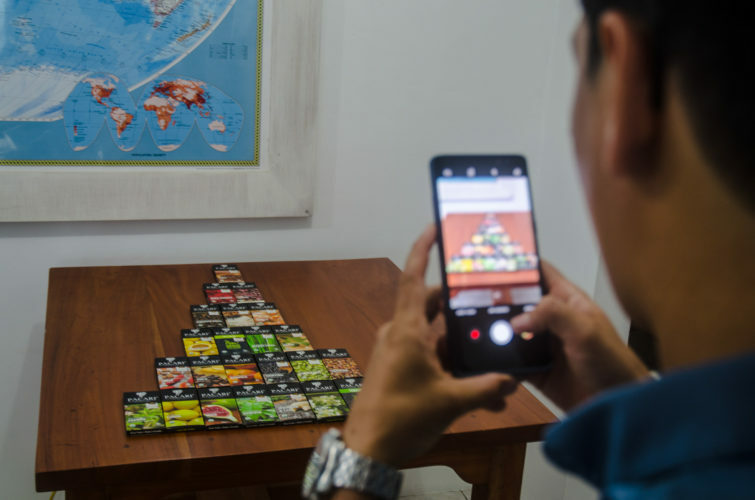 Coffee, Andean Rose and Cherry were the top flavors, and there were plenty of surprises along the way as we tasted these chocolates over the course of many, many days. Thanks to Paul, Andrea, Leidy, Cristhian, Dave, Paolo, Tim, Crystal, Jenny, Dan, Cass, Pablo, Pepo and Zambo for participating. 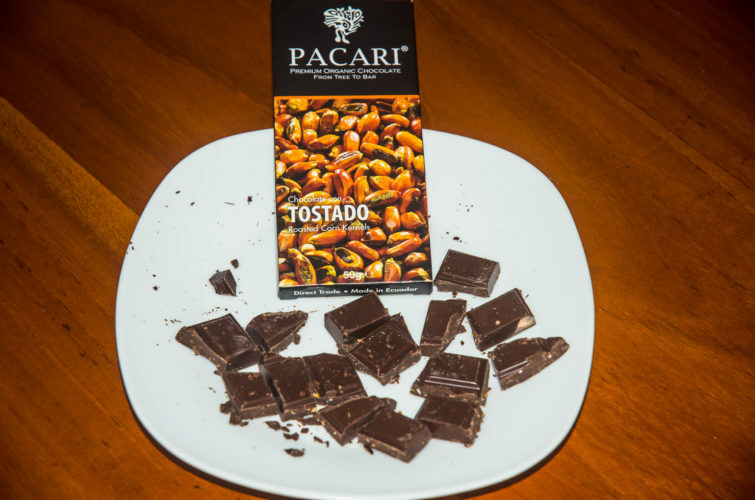 If you have a big craving for chocolate now, come on down to Ecuador! Our country really is known to produce the world’s best chocolate. Galakiwi can even put together a custom tour for you if you want to visit cacao plantations or see how chocolate is made here! 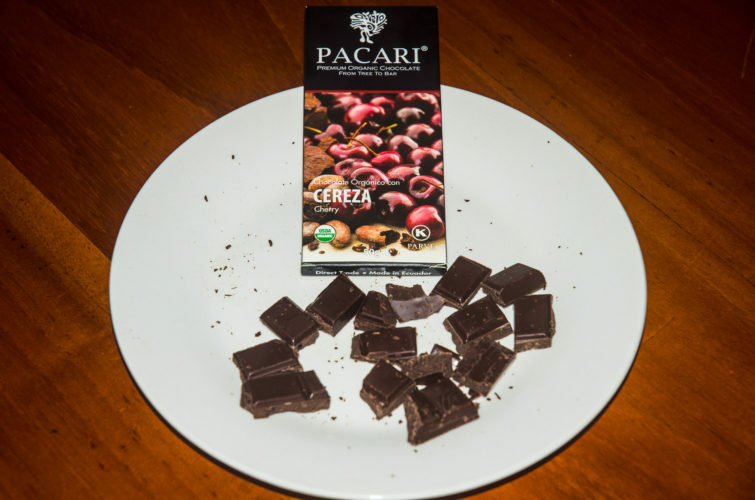 Pacari Chocolate Taste Test is Complete! I love chocolate! 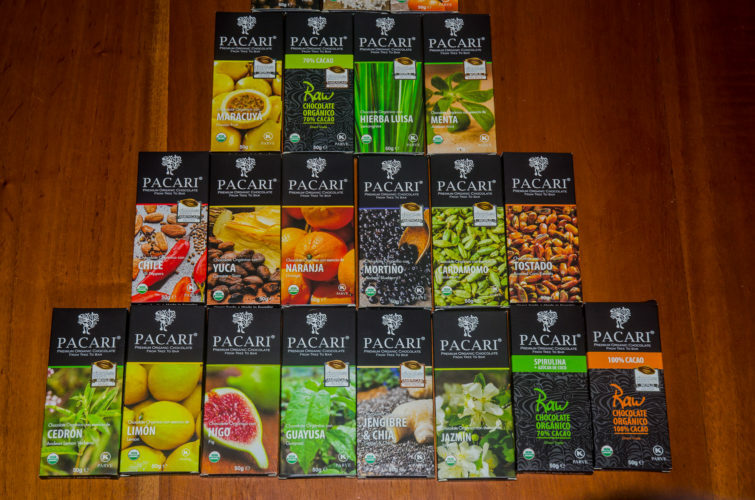 These Pacari varieties look and probably taste heavenly. I would LOVE to try each and every one of these chocolates!